A pilot finds himself stranded in the desert after crash-landing his plane. While he desperately tries to fix the problem, a little boy appears out of nowhere. He is from a tiny faraway planet, where he lives with only three small volcanoes and a rose for company. But the rose has become hard to live with and he Little Prince has decided to go on a journey, eventually arriving on Earth, searching for new friends. But as he finds himself subjected to the stupidity and stiffness of adult world, he starts to wonder whether leaving his rose, his only love, was the best decision after all. More generally though, one can look at The Little Prince as a denigration of how as we grow as adults we forget how to dream and how to use our imagination; of how the things that should matter stop being important and how we get so engrossed in our search of self-fulfilment and greed, we forget who we are and why we are here. I was weary approaching this new version. Despite being a nation of comic-lovers, there has been a lot of criticism in France over this, mainly that it is a sacrilege to even consider “touching” this piece of our cultural heritage. That, in itself, did not bother me; Sfar has done an amazing job at bringing new life to a classic that was written a long time ago and will make it appealing to a whole new generation. Surely that’s a good thing? My main issue with it is that I didn’t like the artwork. It is such a contrast from the Saint-Exupéry’s soft watercolours. I did like his portrayal of the little prince, but was for example extremely disappointed by his drawing of the elephant in the boa (such an important feature of the book). In the original, the simplicity of this drawing is magnificent, and this is lost here. I do like the fact that Sfar gave human features to the rose; I guess the comic format helps to bring extra layers to the story. The most significant here of course is that the pilot appears in this version whereas he is never seen in the original drawings. The focus is invertedly shifted as the pilot, and his feelings towards the little prince take centre stage. It is particularly poignant at the very end, as one can really feel the pilot’s sorrow at losing his friend and all he represents. 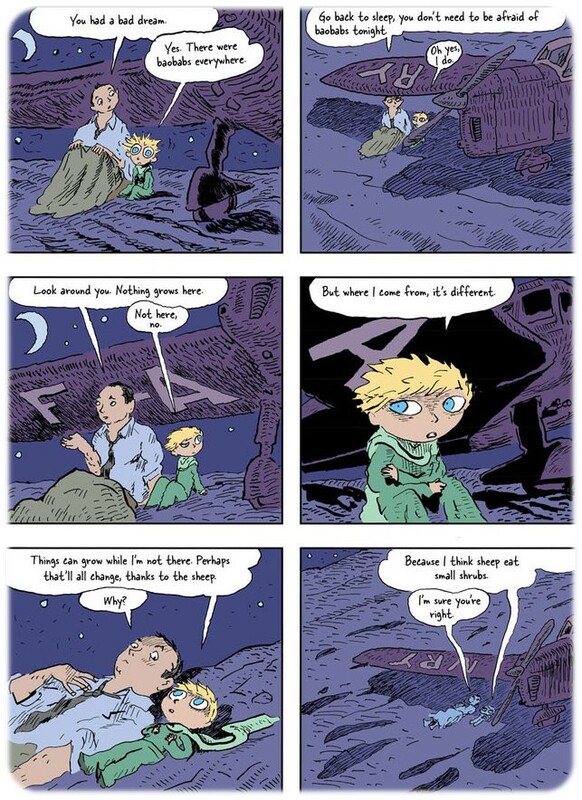 The pilot’s physical features are very obviously based on Saint-Exupéry himself and again I found this particularly poignant towards the end, knowing how Saint-Exupéry perished. I am still undecided about this book. I don’t like the artwork and of course that is primordial when looking at a graphic novel. But as an adaptation, or rather a retelling of the classic novella for a new generation, Joann Sfar has done a grand job; the story feels revitalised, with a new voice, a new view while keeping the ideology at its core intact, and even accentuated. Well-worth a look, but not before you have read the original in my humble opinion. Really interesting review. I’m kind of torn on this one. I’m intrigued by the idea of a graphical novel version of this story, but I’m looking at those pictures of the illustrations and… it’s not what I expected. However, this could be a good thing – a different interpretation rather than imitation. I’m still curious! It is a bit like the movie adaptation of a book – you have to detach yourself from the original story to be able to enjoy it fully. It is a shame about the artwork though; I would have liked it much more if the artwork had “spoken” to me.